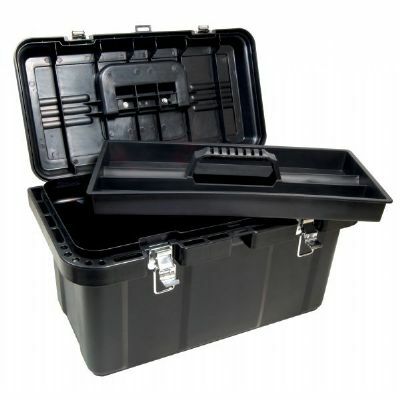 A large, durable plastic tool box with two heavy-duty, locking metal clasps to safely secure the box during transport. Features a lift out tray to reveal a 16"x7¼"x5½" main storage compartment. Built-in tool and brush holder along the edge of box keeps supplies handy while working. Carry handle folds flap into lid. Overall dimensions: 19¼" x 10½" x 11".